In the recent years several papers were published about Oracle’s native authentication protocol and its weaknesses (e.g. : [1.] or [2.]). Those papers covered the 8i version of the protocol which is used by the thin driver in 9i and 10g. Programs have been released to exploit some of these weaknesses (e.g. [2.] or [3.]). The most detailed description can be found in [3.]. The excellent book explains the details of version 8.1.7.4 and says “the genereal process is the same on other oracle versions”. I did not analyze the cryptography used in the new versions, just used the Oracle’s own DLLs to prove the existing problems. 0000051A  00 0c 41 55 54 48 5f 53  45 53 53 4b 45 59 20 00 ..AUTH_S ESSKEY . 000007D4  03 de 00 00 06 00 00 00  00 00 03 73 03 4c e0 dd ........ ...s.L..
000007F4  00 dc eb 12 00 c4 fb 12  00 05 74 65 73 74 31 0d ........ ..test1. The client sends the username and receives the AUTH_SESSKEY and decrypts it with ztvo5kd function. It uses the Oracle password hash. Then the client with the decrypted key and clear text password calls the ztvo5pe function to encrypt the password. The ztvo5pe function generates random bytes with ztcr2rnd and after a couple of transformations extends the clear text password with it. That is why the client sends different AUTH_PASSWORD for the same AUTH_SESSEKEY. The server calls ztvopd function to decrypt the AUTH_PASSWORD. From the description above the most interesting point is that, the longer AUTH_SESSKEY is encrypted with password hash as in 8i, which means if you have the password hash you can also get the clear text password from the sniffed authentication. A proof of concept code can be downloaded from here that uses the oran10.dll’s exported functions and an example running can be found in the appendix. If you do not have the password hash you can initiate an off-line brute-force attack, because the Oracle password hash generation is already well known and several tools are available (e.g. : [4.]) which can do it for you. 00000275  00 0c 41 55 54 48 5f 53  45 53 53 4b 45 59 40 00 ..AUTH_S ESSKEY@. 000002D5  5f 56 46 52 5f 44 41 54  41 00 00 00 00 39 09 00 _VFR_DAT A....9..
000005C2  04 53 00 00 06 00 00 00  00 00 03 73 03 4c d0 dd .S...... ...s.L..
000005E2  00 dc eb 12 00 c4 fb 12  00 05 74 65 73 74 31 0c ........ ..test1. Then the client calls the ztvo5kcs to combine the decrypted AUTH_SESSKEY from the server and a generated key. The two keys are XORed and the final key will be the MD5 hash of the XOR result. Then the client calls ztvo5ke to encrypt its generated key with password hash. The result will be sent as the AUTH_SESSKEY of the client. The next step is the password encryption with the result of the ztvo5kcs (because of the MD5 it is 128bit long). The called function is the ztvo5pe. The server receives the AUTH_SESSKEY of the client and the AUTH_PASSWORD. The AUTH_SESSKEY of the client is decrypted using the password hash with the ztvo5kd function. Then the server combines the decrypted value with its generated key (decrypted AUTH_SESSKEY of the server) with ztvo5kcs. So we can say the situation is the same as with 9i version. The AUTH_SESSKEYs are encrypted with password hash as in 8i, which means if you have the password hash you can also get the clear text password from the sniffed authentication. A proof of concept code can be downloaded from here that uses the oran10.dll’s exported functions and an example running can be found in the appendix. 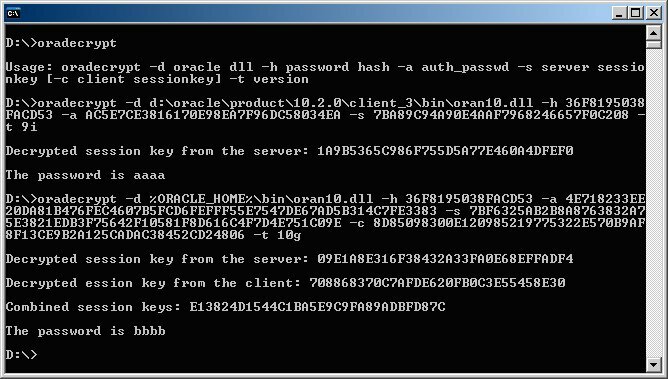 If you do not have the password hash you can initiate an off-line brute-force attack, because the Oracle password hash generation is already well known and several tools are available (e.g. : [4.]) which can do it for you. 00001359  90 d8 12 00 f0 dd 12 00  05 74 65 73 74 32 10 00 ........ .test2..
000013C9  0d 41 55 54 48 5f 54 45  52 4d 49 4e 41 4c 09 00 .AUTH_TE RMINAL.. The servers (9i and 10g) use the same functions to decrypt the new password as with the authentication and the key is the same. Therefore if you have the sniffed authentication data and you have the password hash you can decrypt the new password (and of course the brute force attack is feasible too). You can use the same proof of concept codes as with the authentication just use the AUTH_NEWPASSWORD as the AUTH_PASSWORD. The solution is not a rocket science and if you have a database with sensitive data you may have already implemented it. You should use encryption in the communication channel that means you need either Oracle Advanced Security [5.] or there are other alternative solutions with SSH [6.] or stunnel [8.]. Against a brute-force attack a strong password policy is the best protection. Oracle supports it through profiles. Special thanks go for Balázs Boda, Lajos Antal and Pete Finnigan. The views expressed in this article are my own and not necessarily the views of my current, past or future employers.